Bring a bit of cheer and Luck O’ The Irish to your friends and family this St. Patrick’s Day with a batch of delicious Irish themed Gingerbread Cupcakes or Gingerbread Cookies. Easy and simple decorations would be mixing up a batch buttercream frosting and adding green food coloring, use green jelly beans, green gummy clovers, and any type of green candy. Might be a little easier to decorate your gingerbread cookies with some tinted green royal icing and giving your gingerbread boys and girls some green pants or skirts and matching tops! 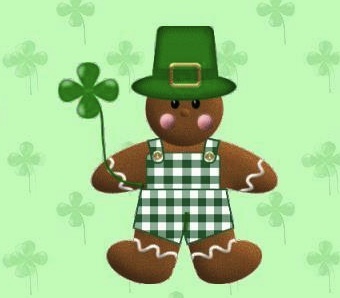 Send us your St, Patrick’s Day Gingerbread creations!!! Recipes Here.